For one night only, enjoy the best-loved songs from the world’s greatest West End and Broadway musicals in a glittering Concert. 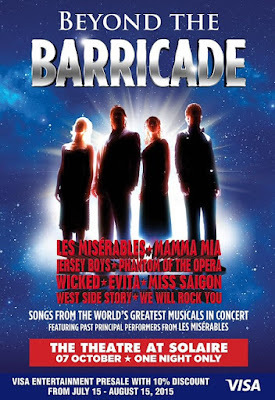 Starring past principal performers from Les Misérables in the West End and on tour, the blockbusting two-hour show features hit songs The Phantom of the Opera, Jersey Boys, Evita, Wicked, Miss Saigon, West Side Story, Mamma Mia and many others, climaxing with a spectacular finale from, of course, Les Misérables. The critically-acclaimed Beyond the Barricade has been delighting audiences throughout the UK and Europe for 16 years, from the Royal Albert Hall to the Cunard liners, and now makes its debut in Manila as part of an Asian tour. 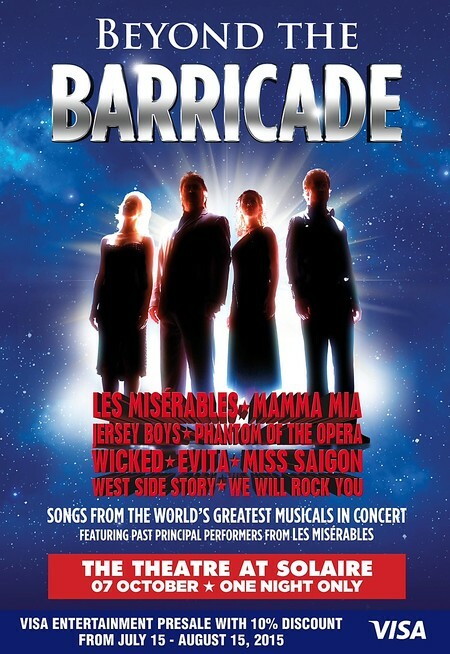 The former cast members of London’s longest-running musical include Andy Reiss, who has played numerous male roles including Jean Valjean; David Fawcett, who played Valjean; Katie Leeming who played the role of Eponine; and Rebecca Vere, who played Cosette. They are joined by an ensemble of talented musicians to create an authentic live experience, capturing all the passions and orchestrations of the original shows.